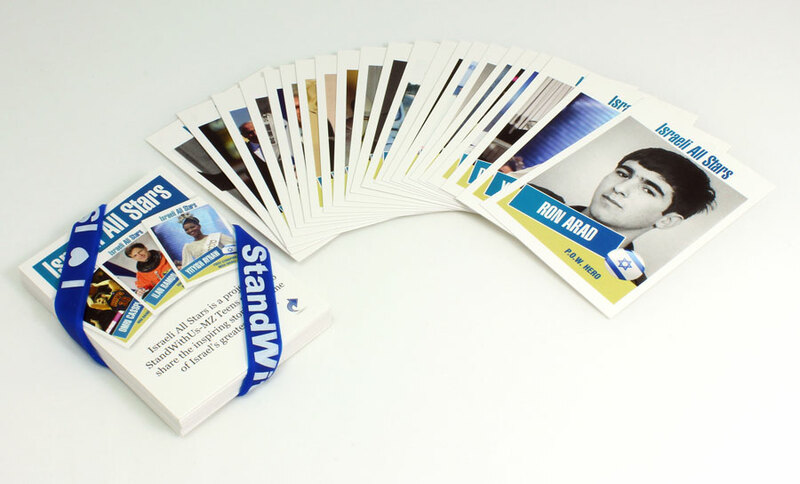 Israeli All Stars is a project of StandWithUs-MZ Teens, created to share the inspiring stories of some of Israel's greatest heroes. Each Israeli All Star contributes to the rich culture and history of Israel and, ultimately, the world. From all walks of life, they are athletes, politicians, artists, soldiers, inventors, and everyday people just like you! We hope that by reading their stories you will be inspired. Who knows? Maybe someday YOU will become an Israeli All Star! Amit Goffer is the Israeli inventor of ReWalk, a unique machine that enables paraplegics to walk again. Chaim Weizmann was a prominent chemist, a Zionist leader and the first president of Israel. David Ben-Gurion, was only 5 feet tall, but he was a giant in modern Israel’s history. Eli Cohen was born in Egypt, made aliyah, and became a spy for Israel. Gilad Shalit was drafted into the Israeli Defense Forces in 2004 where he served in the armored corps. Golda Meir was a Zionist leader who dedicated her life to helping build the Jewish state. Hannah Senesh became a Zionist as a young girl, and moved from her home in Hungary to Israel in 1939 where she joined the Haganah. Ilan Ramon, born on June 20, 1954, became a national icon as an expert fighter pilot in the Israeli Air Force. Michael Levine was an American who made aliyah in 2003 to become a paratrooper in the Israeli Defense Forces. Moshe Dayan was a military hero, government minister, and diplomat. Born in a kibbutz, Dayan joined the Haganah when he was 14. Nadav Ben-Yehuda embarked on his quest to climb to the top of Mount Everest in May 2012. Natalie Portman, an Oscar winning actress, was born Natalie Hershlag in Jerusalem. Natan Sharansky was born January 20, 1948, in the Ukraine, and graduated from the Moscow Institute of Physics and Technology with a degree in mathematics. Noam Gershony was a pilot in the Israeli Air Force during the Second Lebanon War. Omri Casspi built a bridge between Israel and the United States, connecting the two in a unique way—through sports. Peter Bergson (Hillel Kook) fought to raise awareness in the U.S. about the holocaust during WWII, and he urged Americans to help rescue Jews and support Jewish military units and the creation of a Jewish state. Roi Klein was an Israeli Major in the Golani Brigade of the Israeli Defense Forces. Ron Arad was a combat navigator in the Israeli Air Force. Theodor Herzl was the father of modern Zionism. As a journalist covering the Dreyfus Affair - an incident involving a French Jewish officer falsely accused of treason - Herzl witnessed European anti-Semitism. Yityish Titi Aynaw was crowned Miss Israel 2013, making her the first Ethiopian Miss Israel winner. Yitzhak Rabin was born in Jerusalem and joined the Palmach directly after graduating from school when he was 19, and later the Israeli Defense Forces when Israel was reestablished in 1948. Yoni Netanyahu served in the Israeli Defense Forces for twelve years, most prominently as the assault commander of the elite commando unit Sayeret Matkal. Chaim Weizmann was a prominent chemist, a Zionist leader and the first president of Israel. He was elected in 1949. He is famous for helping negotiate the Balfour Declaration. He was a political Zionist and believed the Jews should establish themselves in a homeland because of their millennia-old longing to restore their homeland and to have, like other national groups, a national center and national life, and to escape persecution. According to his vision, this homeland should secure political rights for Jews. Chaim Weizmann is viewed as one of the founders of both Zionism, and Israel itself. Eli Cohen was born in Egypt, made aliyah, and became a spy for Israel. He was sent to Syria where he disguised himself as a Syrian businessman, made important contacts, and rose to become a chief adviser to Syria’s Minister of Defense. His advice helped lead to Israel’s success in the 1967 Six Day War. He told the Syrians to plant trees above their bunkers for shade, giving Israel the locations of all the bunker sites on the Golan Height mountains, in northern Israel. Unfortunately, he was caught and publicly executed in 1965. Eli is remembered as a hero in Israel for his courage and dedication to promoting the Jewish state. Hannah Senesh became a Zionist as a young girl, and moved from her home in Hungary to Israel in 1939 where she joined the Haganah. In 1943, became a paratrooper for the British army. The following year, Hannah was sent on a secret mission to rescue Jews from Hungary. Arrested at the border, she was repeatedly tortured for several months, but refused to reveal any information about her mission. When the Nazis executed her on November 7, 1944, Hannah was only 23-years-old. Throughout her short but heroic life, Hannah kept a diary and wrote poetry which is widely acclaimed today. Senesh is a national heroine in Israel for her courage, poetry, and devotion to her country. Ilan Ramon, born on June 20, 1954, became a national icon as an expert fighter pilot in the Israeli Air Force. He flew in the 1981 secret mission that struck Osirik, Iraq’s nuclear reactor. In 1996 he was given the chance to go into space as an astronaut aboard the Space Shuttle Columbia. He was the first Israeli in space. Although he was not religious, he brought a miniature Torah with him and a pencil sketch drawn by a 16-year-old boy who was killed in Auschwitz. After almost 16 days in space, the Columbia began its reentry, and exploded 16 minutes before its scheduled landing. Everyone onboard was killed. Ramon was only 48. Natan Sharansky was born January 20, 1948, in the Ukraine, and graduated from the Moscow Institute of Physics and Technology with a degree in mathematics. A Zionist, Sharansky became a famous Soviet refusnik when Jews were denied the right to emigrate from the Communist Soviet Union. His activism for the freedom of Soviet Jewry led authorities to accuse him of spying, and he was sent to the Gulag (prison camp) in Siberia where he remained for 11 years, sometimes in solitary confinement. Activists, including his wife, lobbied throughout the world for his release. When he was finally freed in 1986, he went to Israel. He became a famous author, a human rights activist, and a successful politician. He is now head of the Jewish Agency. Ron Arad was a combat navigator in the Israeli Air Force. While on a mission in Lebanon in 1986, a bomb prematurely exploded forcing him and his co-pilot to eject. Arad was captured by Lebanese militia. They sent letters and pictures to Israel to prove that he was still alive in order to negotiate for his release. During his captivity, Arad was secretly handed over to Hezbollah and then to the Iranian Revolutionary Guards. In 2008, Hezbollah officials told the UN that Arad was killed during an escape attempt in 1988. Although presumed dead, Arad is still regarded technically as missing in action, and Israeli prime ministers have remained committed to seeking his release. Arad remains a hero in Israel for the sacrifices he made to protect the state of Israel. David Ben-Gurion, was only 5 feet tall, but he was a giant in modern Israel’s history. Born in Poland and an ardent Zionist, he made aliyah to Israel in 1906. He was a founder of the Histadrut (the trade union in Israel) and became chairman of both the World Zionist Organization and Jewish Agency. He led the country to declare Israeli statehood on May 14, 1948, and became the country’s first prime minister of Israel. Ben-Gurion presided over various national projects aimed at the rapid development of the country and its population, from “Operation Magic Carpet,” the airlift of Jews from Arab countries, to the construction of Israel’s national water carrier, rural development projects and the establishment of new towns and cities. Noam Gershony was a pilot in the Israeli Air Force during the Second Lebanon War. During the war, his helicopter collided with another, resulting in the death of his co-pilot and leaving Noam critically injured. After years of intensive physical therapy, Noam began practicing wheelchair tennis and surfing. In the summer of 2012, Noam won a gold medal in the Paralympics. Noam is a true testament to the Israeli spirit. He shows us that with a little hope in your heart and the will to achieve your dreams, anything is possible. Michael Levine was an American who made aliyah in 2003 to become a paratrooper in the Israeli Defense Forces. On August 1, 2006, during the Second Lebanon War, Michael was killed in action in the Lebanese town of Ayta ash-Sh’ab. His grave is on Mount Herzl, alongside thousands of soldiers who gave their lives defending Israel. Michael’s personal motto was, “You cannot fulfill your dreams unless you dare risk it all.” Michael pursued his dream to defend the state of Israel and made the greatest sacrifice of all, his life. May his memory continue to be a blessing and may his legacy be an inspiration to all. Yitzhak Rabin was born in Jerusalem and joined the Palmach directly after graduating from school when he was 19, and later the Israeli Defense Forces when Israel was reestablished in 1948. He served as a General and the IDF Chief of Staff for many years, after which he decided suit up for a career in politics. Rabin became head of the Labor Party and was elected Prime Minister twice, during which he signed the Oslo Accords with PLO Chairman Yasser Arafat in 1993 and the Israel-Jordan Peace Treaty with King Hussein in 1994. On November 4, 1995, Yitzhak Rabin attended a peace rally in Tel Aviv. Thousands had shown up to sing the “Song for Peace.” Halfway through the rally, Rabin was assassinated by a radical Israeli. Today, Yitzhak Rabin is a symbol of peace, both in Israel and abroad. Gilad Shalit was drafted into the Israeli Defense Forces in 2004 where he served in the armored corps. On June 25, 2006 when Gilad was 19 years old, he was abducted by Hamas terrorists in a cross border raid near the Kerem Shalom crossing to the Gaza Strip. He was kept in captivity, and incommunicado for five years: Hamas would not even permit the Red Cross to visit him. Israelis and Jews all over the world were united in their call to free Gilad. He was finally released on October 18, 2011. Today, Gilad pursues his dream of being a journalist as a sports reporter for prominent Israeli newspaper, Yediot Ahronot. Golda Meir was a Zionist leader who dedicated her life to helping build the Jewish state. She served in prominent positions in pre-state Israel and in Israel after the state was declared in 1948. Golda served as the Foreign Minister, the Secretary-General of the Labor Party and Prime Minister of Israel. She was the first woman to be Israel’s Prime Minister, and the world’s third woman to hold such an office. She courageously led the country during the 1973 Yom Kippur War. Golda passed away in December 1978 and was buried on Mount Herzl in Jerusalem. One of her most memorable quotes is, “Peace will come when the Arabs will love their children more than they hate us.” Golda Meir is an inspiration to all, and showed the world that age and gender do not define a leader. Golda exemplified the fact that leaders are measured by their passion and drive to push for a better tomorrow. Roi Klein was an Israeli Major in the Golani Brigade of the Israeli Defense Forces. During the Second Lebanon War in 2006, Roi led his soldiers in the Battle of Bint Jbeil, during which he was killed after jumping on a grenade to save his fellow soldiers. Roi died with the words of the “Sh’ma” on his lips. His last three words were “Am Israel Chai”. Roi exemplifies the characteristics of a true leader, a hero and a friend. He was and will continue to be a symbol of heroism in Israel and abroad. Yoni Netanyahu served in the Israeli Defense Forces for twelve years, most prominently as the assault commander of the elite commando unit Sayeret Matkal. A war hero who was awarded Israel’s third highest military honor, the Medal of Distinguished Service, Yoni served during the 1967 and 1973 wars. He was the leader of Operation Entebbe, when the IDF rescued 105 Jewish and Israeli hostages held in Uganda in 48 hours, with almost no casualties. But Yoni was killed during this operation. He was 30 years old. Throughout his life, both while serving in the army and as a civilian, Yoni wrote hundreds of letters which were compiled and published after his death. They give insight into the mind of this soldier for peace. Yoni dreamt of a day when no Israeli would have to put on a uniform to defend their homeland. Prime Minister Benjamin Netanyahu is Yoni’s younger brother. Nadav Ben-Yehuda embarked on his quest to climb to the top of Mount Everest in May 2012. Just 300 meters from the peak of the mountain, with a very good chance of setting a record as the youngest Israeli to complete the climb, Nadav saw an unconscious man a couple hundred meters away. Nadav sacrificed his dream to save the life of Turkish climber, Adin Irmak, whom he carried to safety. Nadav’s courageous act built a bridge between Turkey and Israel and taught the world that human life comes before personal gain. Nadav is a hero, an example of selflessness and compassion that we should all aspire to reach. Amit Goffer is the Israeli inventor of ReWalk, a unique machine that enables paraplegics to walk again. Amit’s ReWalk has enabled hundreds of people all over the world to walk, sometimes for the first time in their lives. Despite being ReWalk’s creator, Amit himself is a still confined to his wheelchair because he is a quadriplegic and ReWalk was made for paraplegics. Amit Goffer’s intelligence, ingenuity, and indomitable spirit helped him turn his personal disability into a gift for others that is changing the world, improving it one invention at a time. Omri Casspi built a bridge between Israel and the United States, connecting the two in a unique way—through sports! Omri began his career as a professional athlete in 2005 when he joined the Maccabi Tel Aviv Basketball Team. In 2009, he moved to the United States and joined the Sacramento Kings where he played from 2009-2011, making him the first Israeli to play in the NBA. He currently plays for the Cleveland Cavaliers. Omri is an inspiration to all, a true testament to the Israeli spirit, that with hard work, luck, and hope, anything is possible. Who said a Jewish boy couldn’t play in the NBA? Hannah Senesh became a Zionist as a young girl, and moved from her home in Hungary to Israel in 1939 where she joined the Haganah. In 1943, became a paratrooper for the British army. The following year, Hannah was sent on a secret mission to rescue Jews from Hungary. Arrested at the border, she was repeatedly tortured for several months, but refused to reveal any information about her mission. When the Nazis executed her on November 7, 1944, Hannah was only 23-years-old. Throughout her short but heroic life, Hannah kept a diary and wrote poetry which is widely acclaimed today. Senesh is a national heroine in Israel for her courage, poetry, and devotion to her country. Moshe Dayan was a military hero, government minister, and diplomat. Born in a kibbutz, Dayan joined the Haganah when he was 14. While serving in WWII, Dayan lost his left eye and began wearing his trademark eye patch. A military leader during the wars of Israel's first three decades, Dayan also served in the Knesset as minister of defense, agriculture, and foreign affairs. He was an architect of the Egypt-Israel peace treaty. Dayan's mission in life was to protect Israel and establish peace with its neighbors. Peter Bergson (Hillel Cook) fought to raise awareness in the U.S. about the holocaust during WWII, and he urged Americans to help rescue Jews and support Jewish military units and the creation of a Jewish state. Born in Lithuania in 1915, Bergson joined the Irgun at age 14 to protect Jews in the British Mandate of Palestine, and he was sent to Poland to help Polish Jews move to Palestine in 1937. After Israel was reestablished, Bergson was elected to the first Knesset. Theodor Herzl was the father of modern Zionism. As a journalist covering the Dreyfus Affair - an incident involving a French Jewish officer falsely accused of treason - Herzl witnessed European anti-Semitism. He concluded that reestablishing the Jewish state was necessary for Jews to flourish and for anti-Jewish prejudice to end. The idea seemed preposterous, but he turned Zionism into an international movement. Despite his efforts, he died before the League of Nations endorsed Zionism. Herzl's famous words - "If you will it, it is no dream" - serve as his legacy. Yityish Titi Aynaw was crowned Miss Israel 2013, making her the first Ethiopian Miss Israel winner. She and her family made aliya--immigrated to Israel--from Ethiopia when she was 12. Yityish quickly acclimated, attending Israeli schools and serving as an officer in the IDF. President Barack Obama invited her to meet him during his March 2013 trip to Israel. Yityish will represent Israel in the Miss World 2013 Competition. She says that she plans to represent all Israelis, not just champion Ethiopian-Israelis, and that it will be an honor to represent Israel on the world stage. Yityish challenged established stereotypes and whose perseverance and dedication helped them overcame great odds.